Events are moving quite fast. Beyator Rangorin has gathered wanderers together, Selisa Rangorin has dropped her blood quest against Omanir Poratir until Pwatok is overthrown. Great Eldritch Magics are being performed: ballads once gone, long forgot, are now remembered; Fieral, master of the day, the white beacon of light now glows a dingy red; the Spawn of Circe ride; near the ancient evil called Circe the earth spews forth all hell and death; Bessa the Blesses, Lady of the Dawn has disappeared and not even the ancient Mage Myek can discern where she is. Avinor Elamon has joined forces with the powerful Wizardess Mysim to search for Bessa. None the less Visha Hakor, Orgo Binon, and Morga Parimor search the world for a suitable replacement for the Council of Glend lest the Blessed Lady be gone forever. Dave Emigh. Mr. Emigh ranks high on my personal list of overlooked, almost-greats of the early days of the hobby. He did some work for Games Designer Workshop, technical advice for some sort on both Mercenary and the 2nd edition of High Guard. 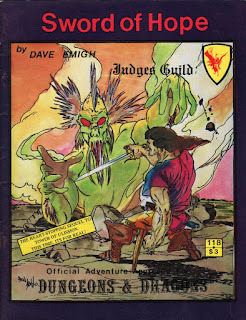 And his small press monograph The Quest is an forgotten classic of the formative days of the hobby. That being said, I'm not sure Sword of Hope is very good as a standalone module. It started life as round 2 of the D&D tournament for Winter War IV in Champaign, Illinois. Next year is Winter War 45, so that pegs the origins of this module at 1977 or so. I haven't read Sword of Hope in years, but as I recall not enough was done to change a team-competitive module into an adventure for normal tabletop situations. If memory serves the problem was further exacerbated by the fact that some of the background didn't make sense without the content in the round 1 module, Tower of Ulission (also by Emigh). But what I love about Sword of Hope is that amazing prose. Emigh was clearly one of those weaver-of-worlds kind of DMs, gifted with the ability to suggest vast vistas with a few choice phrases. I wish I was better at that sort of thing. Heck, you could build a whole dang campaign by simply unpacking that paragraph above, just by answering simple questions like "Who is Beyator Rangorin?" or "Why did Selisa Rangorin declared a blood quest against Omanir Poratir?" or "What are the Spawn of Circe?" or "What is the function of the Council of Glend?" A brief document that explains every item mentioned in that paragraph would give you the launching point for a dozen sessions of play or more.